Discussion in 'History of Style : a remembrance of things past' started by Marvystone, Mar 7, 2009. Robert Piguet was born in Switzerland. 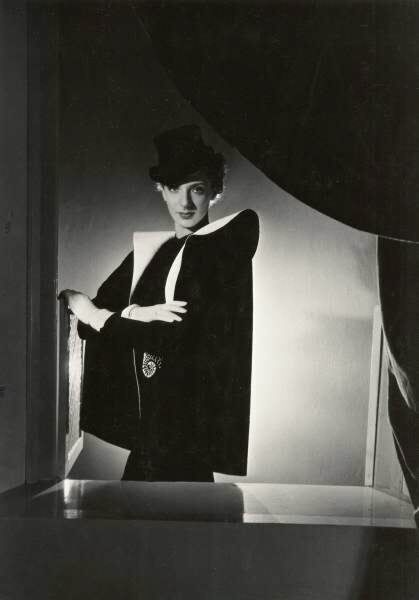 At 17, in the face of heavy opposition from family, he left Yverdon for Paris where he found employment first with Redfern and later with Paul Poiret, his lifelong friend and quite possibly, the most influential designer in the history of haute couture. It was during the years at Rond Point that perhaps the most enduring aspect of Piguet’s legacy took shape. It has been said that Robert Piguet made two indelible and ever-lasting contributions to fashion. Notably, the designers he employed and encouraged; haute couturiers whose creativity, inspiration and passion have influenced, dramatically, the worlds of fashion, film, art, beauty and the way women today look, dress and view themselves. Pierre Balmain, Marc Bohan and Hubert de Givenchy all trained at the hands of this master as did Christian Dior who said “Robert Piguet taught me the virtues of simplicity through which true elegance must come.” Another who benefited from his three-month internship at the House of Piguet was James Galanos, arguably one of only four American designers to be considered haute couture. While very significant contributions were made by these talents, all of who went on to open their own Houses to extraordinary success, Piguet succeeded in maintaining his own identity of House and Collections. And, then, of course, there are the fragrances, a contribution of unrivalled magnitude. It has been observed that Piguet’s perfumes – Bandit, Fracas and Baghari, “have a particular feel, very characteristic of his trademarks: strict adherence to good taste, true luxury, a horror of the commonplace and an innate sense of seduction” True classics of timeless beauty and value that endure far beyond season and trend. And so, although Robert Piguet closed his House in 1951 and died in 1953, all that he accomplished and lived for lives on in women who see and understand his enormous influence on contemporary fashion and its creators, and who surround themselves with the aura of Piguet’s elegance and taste through the perfumes they wear and cherish as a personal signature of style. Incredible, how great to see these! Though he was not the most original when compared to his contemporaries. But I love the house's fragrances, Baghari especially. I don't know why but at first I had confused Piguet with a French watch brand but then I remembered it was something else. You know, it's funny, I've actually seen these same images before (I'm a huge fan of classic fashion from the 30s-40s) but I didn't know the designs were Piguet. I really love that last dress. So gorgeous! circa 1935: A woman modelling a black evening dress with ornate stiff sleeves trimmed with black, orange and grey ribbon designed by Robert Piguet. circa 1935: A woman modelling a black silk polka dot evening dress with an elaborately ruffled neck piece designed by Robert Piguet.